Brief Description: At the age of thirty Wendy Evans, a vivacious, versatile and devoted primary school teacher with singing and acting talents, was struck down by a devastating and very rare nerve disease with serious and debilitating symptoms including pain and foreign body sensations in her throat, shock-like pains in her ears and neck, and difficulty and pain when talking, swallowing, chewing, coughing and yawning. As a consequence, her teaching career and singing aspirations were tragically cut short. Frustratingly, despite numerous doctors’ and consultants’ appointments, and innumerable tests and scans, the medical profession seemed unable to diagnose her problem, to the point that it was viewed as purely psychosomatic and she was seen as a paranoid malingerer suffering from stress and depression and whose problems would be best served by a psychiatrist and a concoction of drugs. But Wendy knew different and was determined to obtain a definitive diagnosis for her condition, which was making her life increasingly unbearable. 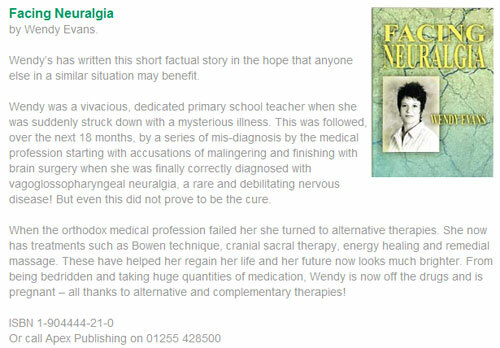 Wendy’s book takes you on a journey from the onset of the illness, through the following 18 months of searching for the cause of her terrible disease and developing an understanding of her disorder, until she finally received a diagnosis of glossopharyngeal neuralgia and underwent brain surgery. When this did not prove to be the cure, she began to look at alternative therapies as a possible way of managing the disease and has finally mapped out a brighter future for herself, regaining control of her life through treatments such as the Bowen technique, craniosacral therapy, energy healing and remedial massage therapies. About the Author: Wendy Evans qualified as a primary school teacher in 1992 and was proud to be a dedicated member of the teaching profession. As a trained singer and dancer, she also enjoyed playing leading roles in many pantomimes and operettas in her spare time. However, her much-loved teaching career and her performing arts pursuits were tragically brought to an end by a very rare nerve disease called vagoglossopharyngeal neuralgia. She has had to battle long and hard against all the odds to regain her life and her dignity, and her desire has been to bring her story to the public’s attention. A sometimes harrowing account of Wendy's struggle to find out the causes of her debilitating symptoms. Some doctors virtually calling her a liar and one in particular who, in my opinion, should be suspended and sent back to medical school to concentrate on his patient relationship skills. Wendy showed great courage and determination to rise above immense pain, brain surgery and several other daunting events, to get her life back on track and start down a path of holistic and remedial therapies that give other sufferers of similar symptoms hope for their own futures. Wendy desrves immeasurable praise for producing this work and I hope it sells well. It deserves to! Well written and researched. Wendy is a teacher from the UK who was struck by glossopharyngeal neuralgia. While looking for answers on the internet, she chanced upon an academic article that I wrote for the Singapore Medical Journal. She contacted me for help to find answers to the severe throat pains that she was experiencing. Over the months as we emailed one another, I learnt so much about glossopharyngeal neuralgia and what it can do to a person. It was a two-way exchange. We both grew in our knowledge of not just neuralgia, but of human suffering and fortitude. From Wendy, I learnt about the strength of the human spirit, and the ability to rise to the challenge of overcoming physical pain and disability. 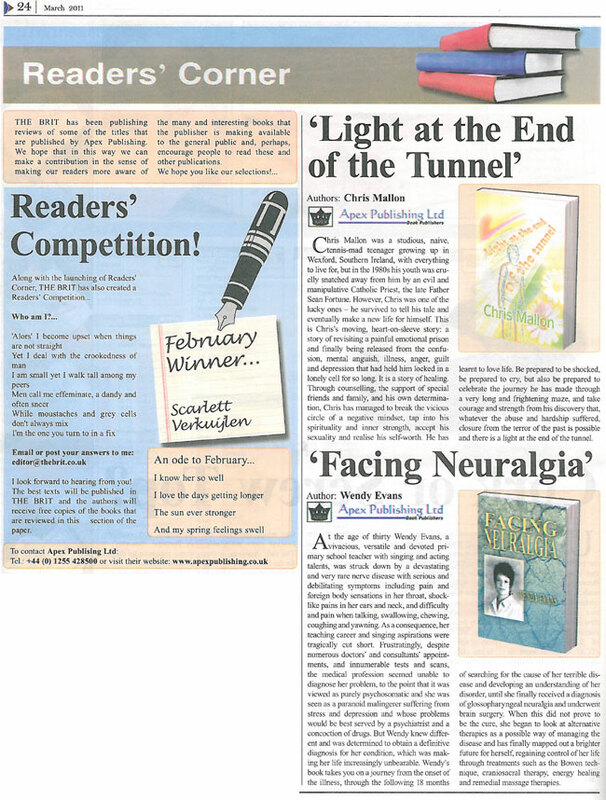 "Facing Neuralgia" is a book about her quest for well-being. Wendy, if you are reading this, I thank you. When we go to the doctors we expect dedication, treatment and most of all the correct diagnosis and eight out of ten times we receive this. But Facing Neuralgia the amazing book written by Wendy Evans tells the horrifying true story of how doctors can and do get it wrong. Wendy Evans tells the story in her own words how she and her family had to fight over an eighteen month period with strength, determination and pain to receive the right diagnosis. This was a tired and hard battle that should not have, and hopefully should never again be a needless battle. The author had to go down a long and stressful road to convince the medical profession that their diagnosis was wrong and she was in fact seriously ill.
Each careful written word with the authors own and un-interfered tongue escorts you along her painful and tearful journey. From the heartache of losing her teaching career to her hard and stressful battles with the medical profession, just to be rightly diagnosed with and treated for “Glosspharyngeal Neuralgia” (GPN). Glosspharyngeal Neuralgia is described as a deep stabbing pain in one side of the throat. The pain is near the tonsil area and can extend into the ear which you can imagine is a life changing and painful condition. Facing Neuralgia has been written in such a personal way that you feel her pain, you hear her anger and you believe that you are that dedicated survivor, Wendy Evans. But with every pain is a happy ending and this enjoyable, crafted book has the best happiest ending that every book should have. 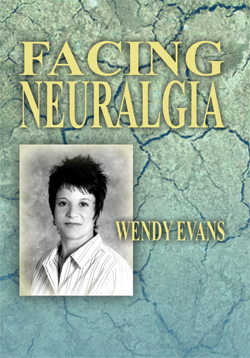 If you want to read a book that moves you, read Facing Neuralgia, if you want to know more about (GPN) then there is no better place to start than Facing Neuralgia and if you want to hear a true, painful, and emotional true story about a regrettable wrong diagnosis then listen carefully to the words of Wendy Evans. If you have never heard of GPN before then after reading this book you will never be able to forget it. Wendy Evans was interviewed about 'Facing Neuralgia' on BBC Radio Hereford & Worcestershire 104.4 FM on 'The Howard Bentham Breakfast Show'. Wendy Evans appeared on her local BBC news: BBC Hereford & Worcestershire and was interviewed about her book 'Facing Neuralgia'. Having known Wendy from her early teaching and performing days, it’s a crying shame she is no longer able to follow her dreams. Her book gives an insight to the pain and frustration she must have gone through as well as the relief in finally getting the correct diagnosis for her illness. Hopefully her words will prove a solace and an inspiration for fellow sufferers. This book is a truly remarkable achievement in the face of almost impossible odds. We have been with Wendy from the onset of her illness to the present. We are extremely proud of her and hope the book will bring knowledge and comfort to others, who may find themselves in a similar situation. I was surprised how much Wendy has had to cope with. It is a very interesting book and I recommend that people should read it. I am really proud of Wendy for writing this book and I wish her lots of happiness for the future.